Researchers at work in the onboard ROV control van. Photo courtesy of Ocean Exploration Trust / Nautilus Live. ECOGIG researchers - led by Chief Scientist Dr. Iliana Baums of Pennsylvania State University - will embark on a 12-day expedition in the Gulf on June 12, 2017 to investigate the impacts of oil, methane, and chemical dispersants on the deep sea ecosystem— in particular deep sea corals. Deep sea corals are ecologically important and provide vital habitat for marine life, including commercially important species like shrimp, crab and grouper. A primary research focus of this expedition is to capture high-resolution photos of these ecologically important deep sea corals and document how oil, methane, and chemical dispersants resulting from the spill influence coral recovery and survival year after year. The team will send a remotely operated vehicle (ROV Global Explorer) to depths of over 1000 meters and use high-resolution cameras mounted on the ROV to capture hundreds of still images of corals they have been monitoring yearly since shortly after the spill in 2010. These photographic data will be collected and analyzed—along with images from prior expeditions—to document the spill’s impacts and improve understanding of the mechanisms that influence coral recovery and survival. Team members from Penn State and USGS are also interested in better understanding how deepsea ecosystems in the Gulf respond to natural hydrocarbon seeps (areas of the seafloor where natural oil and gas-rich fluids seep into the ocean). Specifically, the researchers will study how corals, infauna (animals living in the sediments), and microbiomes (all microorganisms in a particular environment) of animals, sediments and the water column respond to natural seafloor hydrocarbon seepage. Understanding how ecosystems respond to natural inputs of oil will help scientists analyze the biological and ecological effects of the 2010 oil spill. This research has implications that may inform management responses to anthropogenic hydrocarbon releases (human caused releases of oil and gas) that have already occurred and those that could potentially occur in the future. PSU researchers will collect live corals from the seafloor to conduct laboratory-based experiments in an attempt to understand how these corals respond to marine snow (organic material that falls from upper waters to the deep ocean) that has become toxic due to oil and chemical dispersant inputs. 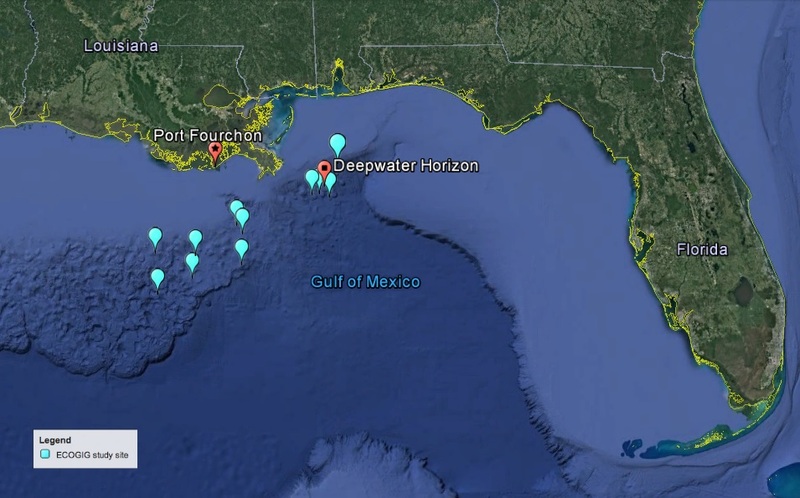 The deposition of toxic marine oil snow is thought to be one of the mechanisms that impacted the deep sea ecosystems of the Gulf after the spill. The population-level genetic structure and gene flow of the live coral samples will also be analyzed by a team member at Lehigh University via laboratory-based experiments. Learning more about how these deep sea corals are genetically different or similar to one another will further scientists’ understanding of how corals may recover from disturbances such as the Deepwater Horizon oil spill than others. ECOGIG outreach and communication specialists aboard the ship during the expedition will connect with the public in a variety of ways. 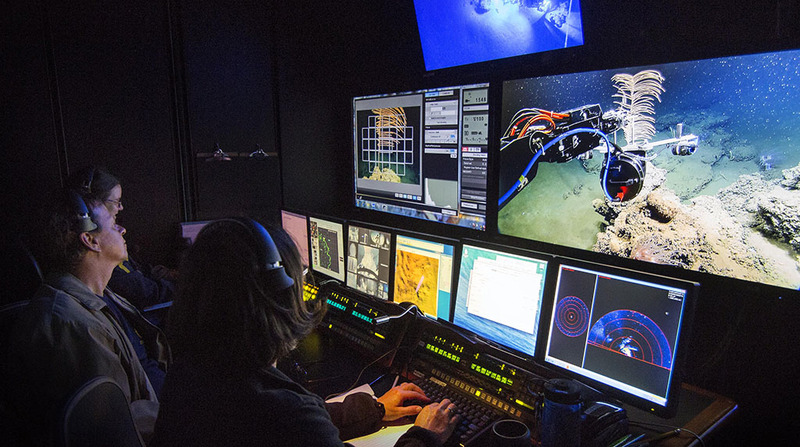 A live ROV camera feed will be accessible throughout the expedition on YouTube. School children and summer campers across the U.S. will interact with scientists onboard during live question and answer sessions, and in collaboration with Mission Blue, an interactive Facebook Live video hosted by Ocean Allison will be broadcast to a worldwide audience from the Gulf of Mexico. Anyone can stay up to date on the research in real time by following along via ECOGIG’s Facebook, Twitter, and Instagram channels. Additional content including educational videos, podcasts and a documentary short film will become available after the expedition.